Fire, perhaps more than the other classical elements, can completely change all carbon-based materials. That transformation may sometimes be devastating but at other times it can be hugely beneficial. Most people tend to dwell on its wilder nature when it can voraciously consume forests along with any other flora and fauna in its path. It recently turned Paradise, CA into an inferno, leaving little life in its wake. But when tamed, fire has provided the means for humans to survive and thrive for millennia. It hardly needs mentioning that we humans owe much to the transformational powers of burning or what is more technically referred to as combustion (an exothermic reaction which generates heat, light and a solid ash by-product). From converting raw meat into edible protein to converting heat into electricity to power countless conveniences; tamed fire has made life for humans significantly more palatable. We’ve learned how to tame fire with ever more sophistication over the centuries, enabling the production of more diverse and beneficial co-products while also taming many of the emissions that filled the skies with smoke and other nasty particulates. Our burning techniques have progressed from simple campfires to sophisticated ovens; both use fire but the later is far easier to control and to use for creating mouth-watering masterpieces. This comparison highlights the difference between combustion and pyrolysis, a thermochemical process which decomposes organic material in an oxygen limited environment. (Some cooking ovens, in fact, are called pyrolytic ovens, but more commonly they are known as self-cleaning ovens!) There are a growing number of ways to achieve an oxygen limited environment, some sophisticated, some simple which indigenous cultures around the globe figured out centuries ago and created the now famous dark earth soils. While simpler technologies can produce high quality biochar, more sophisticated technologies can create and/or capture gases, liquids, heat or even electricity. When considered holistically our ability to tame fire and burn or bake all manner of underutilized organic materials, could be what keeps life on earth palatable moving forward. 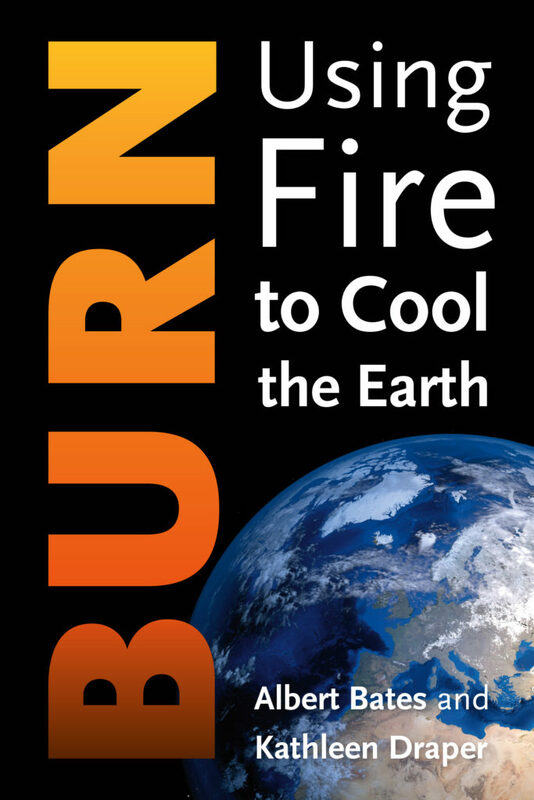 In BURN: Using Fire to Cool the Earth (due out Feb 26), my co-author Albert Bates and I showcase the growing number of ways that tamed fire can be put to work to decarbonize households, products, industries and the planet. We outline how pyrolysis can help rebalance carbon by banking it instead of blowing it. We explore the burgeoning research showing how biochar’s benefits extend well above and beyond soils. We highlight how the ready-to-boom biochar industry is helping to store stable carbon in both consumable products such as cattle feed and kitty litter as well as durables such as asphalt and concrete. We hope that the perspectives provided in BURN will cause more companies to consider cashing in on caching carbon.